The fabulous season of fall is here! Let’s celebrate by finding fun and frugal ways to enjoy all of the beauty that surrounds us. 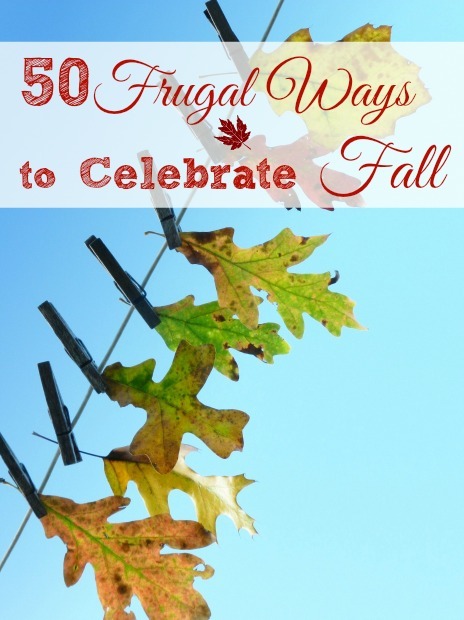 Take a peek below at 50 frugal ways to celebrate fall, so you can make sure you get the most fun out of this season for less. 1. Create a leaf banner. 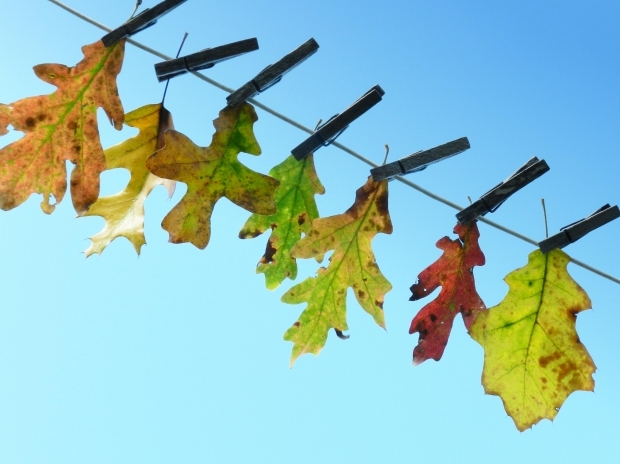 Use clothespins to secure colorful leaves to some ribbon or string. 2. Do leaf rubbings to create colorful artwork. 3. Start a leaf collection. Press the leaves between wax paper to dry and preserve them. 4. Learn more about identifying leaves via the internet or a library book. 5. Collect acorns. Dip them in craft glue then glitter for fun bowl fillers. 6. Fill a vase with acorns then tuck a battery operated votive in them. Presto! You have a great centerpiece. 7. Make a leaf mobile. Attach leaves to ribbon and hang them from a hanger. 8. Visit a local pumpkin patch. Enjoy a hay ride. 9. Carve pumpkins as a family. You can even choose a them to create your pumpkins around. 10. Paint funny faces on gourds and pumpkins. 11. Carve out the top of a pumpkin a place a plant inside for an instant pumpkin planter. 12. Decorate your front porch with mums and pumpkins for a fun fall look. 13. Gather up old clothes and make a scarecrow as a family. 14. Enjoy a corn maze. 15. Snack on some cider and cinnamon donuts. 16. Bake some apple crisp and enjoy it with coffee. 17. Read a book with a hot spiced latte. 18. Use fall spices such as cinnamon, nutmeg, and cloves in your cooking. 19. Use these same herbs and dried fruit to make your own potpourri. 20. Watch a colorful sunset. 21. Visit the zoo for one last time this season. 22. Decorate with some colorful Indian corn. 23. Have a fun game a football in the yard. 24. Rake some colorful leaves and jump into them. 25. Decorate the yard with fun fall décor found at local thrift shops. 26. Watch a family friendly Halloween flick. 29. Create a tabletop cornucopia with fruit, nuts, and a pretty basket. 32. Visit an outdoor farmer’s market and grab some fall treats. 33. Add a warm colored scarf to your wardrobe. 34. Add some earth tone throw pillows to your space. 35. Find a cozy throw to enjoy the cool nights with. 36. Go on a hunt for the largest leaf. 37. Give the dog a fall themed bandana. 38. Enjoy some hot chocolate. 39. Start crafting your own Halloween costumes. 40. Make a hearty stew. Find recipes online or at the library. 41. Color with fall colored finger paints. 42. Go on a nature walk. Look for signs of fall. 43. Take a lazy trip down the river in a canoe. 44. Pack a picnic and enjoy the fall weather. 45. Have a chili cook off with friends. 46. Dry apple slices and craft with them. 47. Go apple picking as a family. 48. Make your own apple pie! 49. Grab a tin of pumpkin spice and add it to play dough. Or anything for that matter! 50. Melt some caramel and dip apple slices in it. See how fun and frugal the fall season can be? Give these ideas a try and you are sure to enjoy the fall season for less.